This is part 3 of 3 part series of tutorials. You can access Part 1 and Part 2 here. Learn to use new data types like struct to organize and store data on the blockchain. Learn the concept of tokens and its usage. Learn to make payments using Ether, the currency of the Ethereum blockchain platform. As you may know, in a general election, every citizen gets to cast one vote for their favorite candidate. However there are elections like electing a board of directors of a company where you are a shareholder, you get to vote based on the number of shares you own in that company. So, the more shares you own, the more votes you get. Let’s enhance our voting dapp to support this type of election. We will add functionality for anyone to purchase shares in the company. They can then use those shares to vote for the candidates. We will also add a feature to lookup voter information. In the Ethereum blockchain world, these shares are more commonly referred to as tokens. We will refer to these shares as tokens in the rest of this tutorial. If you want to skip all the explanation and want to just see the contract file, you can find it here: https://github.com/maheshmurthy/ethereum_voting_dapp/blob/master/chapter3/contracts/Voting.sol. The first step is to declare the variables we need to store all the information we are interested in. Below are the contract variables with explanation. // 1000 is the total number of tokens for sale and the price of each token is set to 0.1 ether. // We will revisit this section again later in this tutorial. Now that we have initialized the tokens and set the price, let’s see how someone could purchase these tokens by paying ether. Here is the function to buy tokens. function. Accepting money can not get any easier than this! The value: web3.toWei(‘1’, ‘ether’) argument is accessed in the buy() function using msg.value and msg.sender gives us the account address of web3.eth.accounts. Assuming the value of each token to be 0.1 Ether, the web3.eth.accounts will receive 1 Ether/0.1 Ether = 10 tokens. 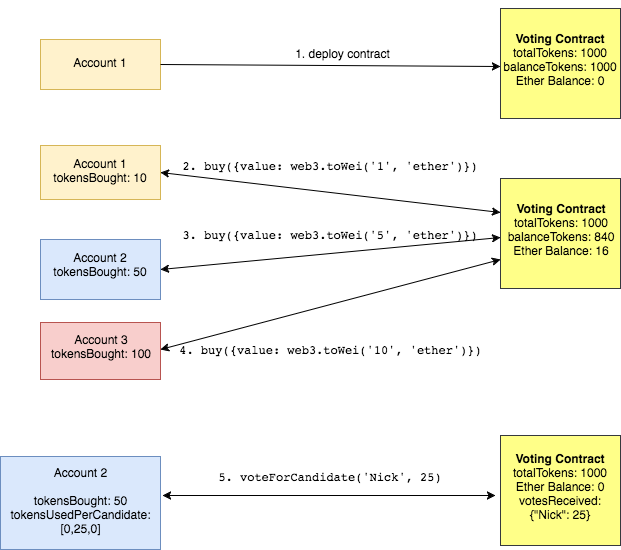 Let’s take a break from looking at the code for a moment and visualize the interaction between accounts (voters) and the contract. As you can see in the contract file on github, the rest of the new methods in the contract are mostly getters and should be easy to follow along. To vote for a candidate, you now have to specify the no. of tokens you want to vote with. There is a new section where you can purchase tokens. You can now look up voter information — how many tokens they own and no. of votes they have cast to each candidate. The candidates are not hardcoded anymore. We fetch the candidates from the blockchain and populate it. The app.js file has the updates to support all the UI functionality above. Update the deployment file 2_deploy_contracts.js to pass in total tokens and token price along with candidate names. To summarize, the four files we have updated in this tutorial are Voting.sol, index.html, app.js and 2_deploy_contracts.js. Once you have updated your truffle repository with these files, we can deploy the contract to the blockchain. The deploy process is exactly the same as the previous tutorial. You just have to compile and migrate using truffle command. 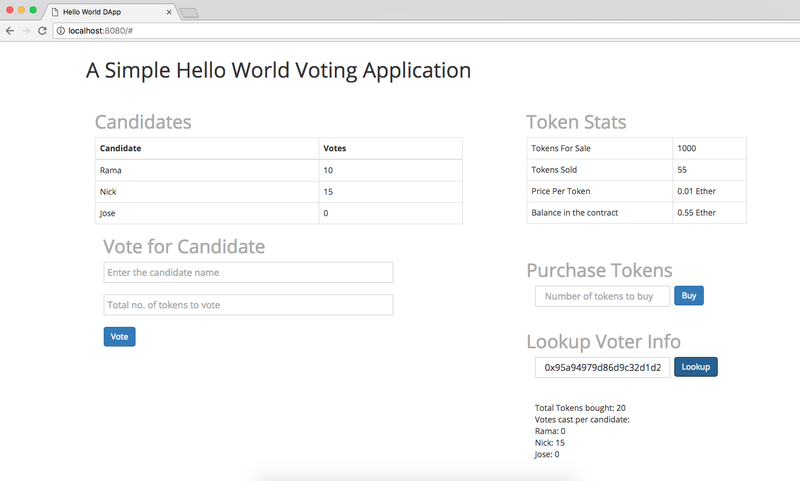 As you can see in the screenshot above, you will be able to purchase tokens, vote for candidates using the tokens and lookup voter information by their address. If you are able to get all these features working, congratulations! I hope this series of tutorials has given you an idea of what Ethereum is, its capabilities, and how to build decentralized applications. If you run into issues getting the application working (github repo), feel free to DM me on twitter @zastrinlab. If you want an even more challenging project, I created a course to build a decentralized eBay on Ethereum & IPFS. If you would like to get notified when I write more tutorials, you can subscribe here. Thanks Raine Rupert Revere and Evan Van Ness for all the feedback.